Christmas for the Commandos in Afghanistan was always going to be different - but no one could have predicted just how different. One minute they were singing carols at dusk beneath a mellow sun in the baked bare wasteland of Helmand province while wearing festive Santa hats, the next they were firing mortars after their Christmas Day service came under attack from the Taliban. So rapid was the reaction of Royal Marines of 40 Commando that within less than a minute of the first "contact" from the Taliban's machine guns, they had sprinted the 200 metres to their mortar lines and had begun to return fire. 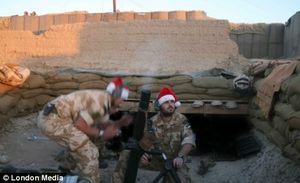 And as these remarkable pictures show, such was the urgency there was no time to change their festive head gear into helmets and for 45 minutes they mortared Taliban positions with their ear defenders over their floppy bright red hats - and in one case a Christmas tree hat complete with coloured baubles. A helmet with reindeer antlers and bells was left on the ground in the rush. Once the skirmish was over - and with no British casualties - the men and women calmly resumed their carol service in virtual darkness around the simple war memorial at Forward Operating Base Inkerman in northern Helmand.